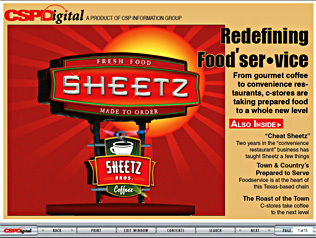 Welcome to CSPDigital's Foodservice edition, a special-edition online magazine focusing on the foodservice category. “Cheat Sheetz”: It’s been nearly 18 months since Sheetz, Inc. opened its “convenience restaurant” concept to much fanfare. Since then, it’s opened a second – but will stop there. What did it learn in the process? Town & Country’s Prepared to Serve: How this successful southwestern chain focuses on fresh prepared food. The Roast of the Town: Convenience retailers get aggressive in their efforts to cash in on the coffee craze. Simply right-click the link below and choose “Save Target As” to save the pdf to your desktop. Please allow 1 to 2 minutes for the magazine to download. CSPDigital requires a high-speed Internet connection and Adobe Acrobat Reader 6.0. or above.To download the free Acrobat Reader, click here. Sound must be turned on to hear audio messages. After reading this issue, click here to share your feedback on this and other editions of CSPDigital.